Both divisions of the newly formed East Coast Entertainment Group are excited to share the plans for the three additional production/rehearsal studios at our Carroll Music facility in Manhattan! 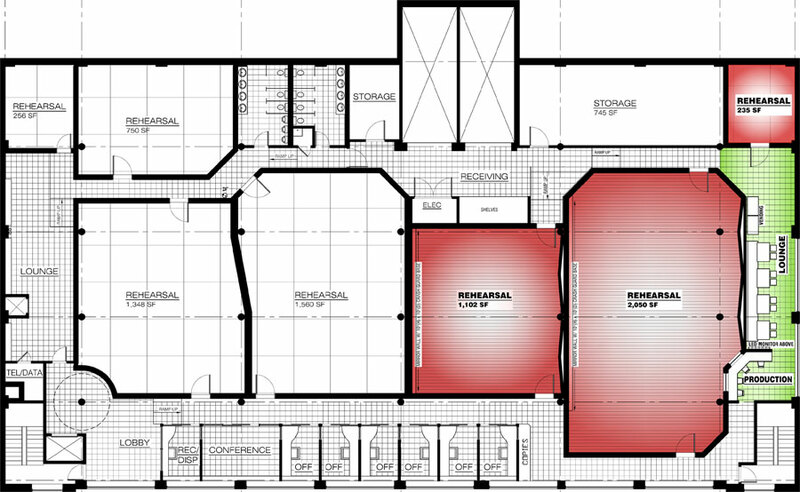 Starting in early January and hopefully finishing by late spring, we are adding three state of the art rooms (in red) designed by Robert Hansen and Associates. Full, modern Professional Audio and wiring, to meet any of your production needs . . . and (of course!) access to our newly expanded full-backline and huge percussion inventory. Studio #6 will also offer an adjacent production desk with windows through to the studio, to provide a line of sight to performers, without interrupting rehearsal. Studio #7 gives us another small room, perfect for a group of six or less. We are also building a new, second lounge area (green) — and a third that isn’t pictured yet — so our valued clients can continue to be as comfortable as possible. Our install division will also be adding some very cool lighting and flat screen TVs throughout the 17,500 square foot facility. Our plan is to make our clients a part of this exciting project by posting updates, pictures and stories throughout the construction process. Hopefully all good stories!